SHIRLEY XIMENA HOPPER RUSSELL | Geringer Art, Ltd.
SHIRLEY XIMENA HOPPER RUSSELL (American, 1886-1985). Painter and teacher Shirley Russell was born at Clifton, California, May 16, 1886, to a father who had served as a major in the Civil War. She attended Palo Alto High School, and then earned her BA from Stanford University where she first became interested in art. After marrying engineer Lawrence Russell in 1909, she gave birth to a son, John Preston Russell. Following the death of her husband in 1912 Russell began to paint and worked as a teacher in Palo Alto. 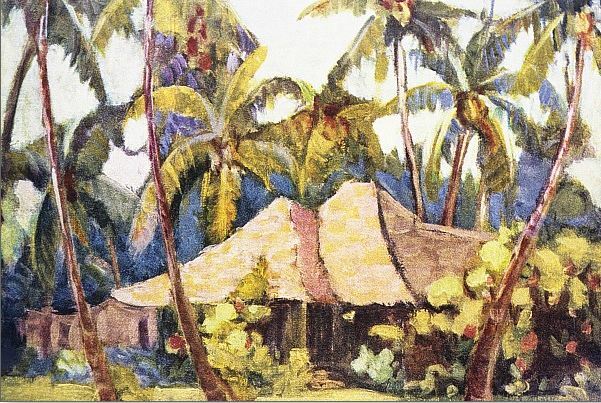 After additional studies at the School of Arts and Crafts in Oakland, the California School of Fine Arts, and San Jose State University she visited Hawaii with her son in 1921 and decided to stay. In Hawaii she studied with Lionel Walden and was able, during the 1930’s, to study in Paris at La Grande Chaumiere, and the Academic Julian with Andre Lhote. She also travelled in Europe, Japan, Korea and Manchuria, and had additional studies with Rico Lebrun and Hans Hofmann. She influenced a generation of students — including Satoro Abe and John Chin Young — as an art teacher at McKinley High School in Honolulu (1923-46) and continued her own artistic education by attending University of Hawaii summer sessions. During her lifetime Shirely Russell had one-person shows at The Honolulu Academy of Arts (1964), The Royal Hawaiian Gallery (1966) and particpated in exhibits at the LA County Museum of Art and the Grand Palais Annual Juried Exhibition in Paris. Although Russell was best known for her figurative works including tropical flowers, seascapes and portraits she was an avid supporter of abstract art. An active painter until the very end of her life, Shirley Russell died in Honolulu in 1985 at the age of 98. Her work can be found in the collections of The Contemporary Museum, Honolulu, the Hawaii State Art Museum, The Imperial Museum, Tokyo and the Honolulu Academy of Arts.